MSRP: Starting at $595,000 USD. Monaco has made a bold statement with its introduction of the new 2015 Dynasty. 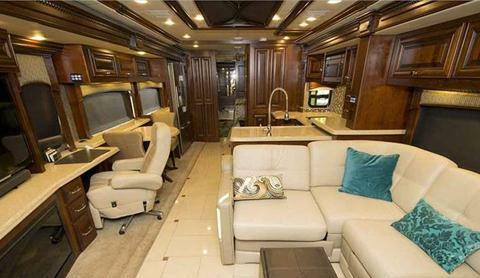 Its features are specifically designed for the wealthy RV owner who is accustomed to luxury. 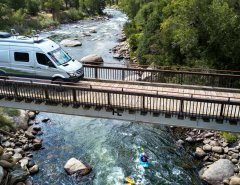 It has an all new Roadmaster chassis with 600-hp, this engine which is meant to see the owners through all of their travel destinations. The cockpit of the Monaco Dynasty has an elengant Smart Wheel with adjustable settings and features. The interior is spacious and comfortable. There is porcelain tile throughout the coach and premium hardwood cabinetry and moldings. For work on the go, there is a desk area with comfortable executive style chair and ample space for your computer. Next to this are 2 extra folding chairs for entertaining with additional table surface. Counter pop-up USB ports and plugs are hidden away when not in use. The residential style kitchen is fully equipped with polished solid surface countertops and a decorative backsplash. The drawers and cabinets everywhere for ample storage. 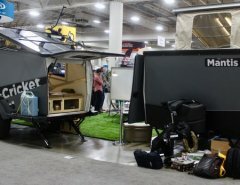 A new feature, is a pop up coffee or toaster valet, and appliance garage. All appliances are stainless steel. A large two burner induction cooktop, convection/microwave oven and full size french door refrigerator with ice maker, large double sink with a high rise galley faucet with a sprayer. The Ultraleather sofa turns into a sofa bed with an air mattress. 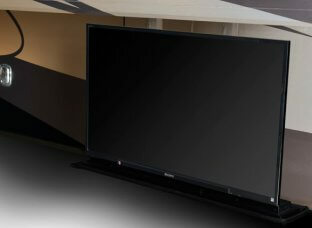 This living room is complete with a 50” Sony screen HDTV with a Blue Ray player and built-in Wi-Fi. 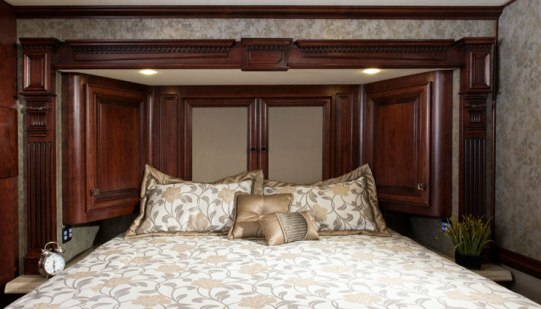 The bedroom boasts all of the fine finishes, woodworking and closet/wardrobe/dresser amenities you could hope for. It’s a queen or king size bed with a memory foam mattress, also has a 40” LED TV, full dresser, two side night tables, and an OHC. The Monaco Dynasty’s gorgeous dresser with ample drawer and storage also features a huge LED TV, window, shelf for seating, clothing, shoe placement and plenty of lighting. With finishes like these in the 25 Palace, it’s hard to tell if you are in a luxury suite in one of the finest hotels or actually in your stunning motorhome! 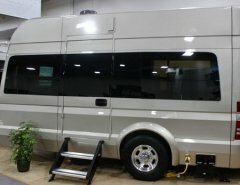 This is truly a hotel on wheels. All the comforts of a luxurious stay, no matter where you travel and park this beauty. This complete bathroom includes a ceramic commode, full undermount sink with vanity countertop with wood cabinetry, medicine cabinet, towel and tp holders, a window complete with shades for privacy, and shelf space for all those toiletry items. There is also a huge 54” shower with an integrated bench seat, nooks and crannies for all of your showering needs. A clothes washer and dryer, and wardrobe cabinet is also inside this huge bathroom. 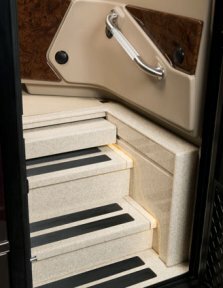 Ample storage on the outside of your Monaco Dynasty 25 Palace includes electric slide out compartments, and deep lockers for your travel needs, and easy access. 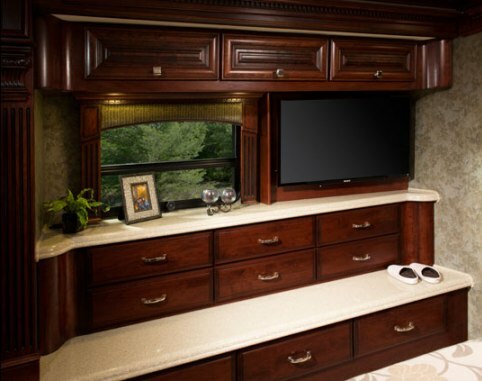 Exterior has a drop-down TV and easy step stairs with rail to enter the coach. The outside is a seamless design in 3 different full body graphics.